With the availability of high performance CPUs and GPUs, it is pretty much possible to solve every regression, classification, clustering and other related problems using machine learning and deep learning models. However, there are still various factors that cause performance bottlenecks while developing such models. Large number of features in the dataset is one of the factors that affect both the training time as well as accuracy of machine learning models. You have different options to deal with huge number of features in a dataset. Try to train the models on original number of features, which take days or weeks if the number of features is too high. Reduce the number of variables by merging correlated variables. Extract the most important features from the dataset that are responsible for maximum variance in the output. Different statistical techniques are used for this purpose e.g. linear discriminant analysis, factor analysis, and principal component analysis. In this article, we will see how principal component analysis can be implemented using Python's Scikit-Learn library. Principal component analysis, or PCA, is a statistical technique to convert high dimensional data to low dimensional data by selecting the most important features that capture maximum information about the dataset. The features are selected on the basis of variance that they cause in the output. The feature that causes highest variance is the first principal component. The feature that is responsible for second highest variance is considered the second principal component, and so on. It is important to mention that principal components do not have any correlation with each other. There are two main advantages of dimensionality reduction with PCA. The training time of the algorithms reduces significantly with less number of features. It is not always possible to analyze data in high dimensions. For instance if there are 100 features in a dataset. Total number of scatter plots required to visualize the data would be 100(100-1)2 = 4950. Practically it is not possible to analyze data this way. It is imperative to mention that a feature set must be normalized before applying PCA. For instance if a feature set has data expressed in units of Kilograms, Light years, or Millions, the variance scale is huge in the training set. If PCA is applied on such a feature set, the resultant loadings for features with high variance will also be large. Hence, principal components will be biased towards features with high variance, leading to false results. Finally, the last point to remember before we start coding is that PCA is a statistical technique and can only be applied to numeric data. Therefore, categorical features are required to be converted into numerical features before PCA can be applied. The dataset consists of 150 records of Iris plant with four features: 'sepal-length', 'sepal-width', 'petal-length', and 'petal-width'. All of the features are numeric. The records have been classified into one of the three classes i.e. 'Iris-setosa', 'Iris-versicolor', or 'Iris-verginica'. The script above stores the feature sets into the X variable and the series of corresponding labels in to the y variable. It is only a matter of three lines of code to perform PCA using Python's Scikit-Learn library. The PCA class is used for this purpose. PCA depends only upon the feature set and not the label data. Therefore, PCA can be considered as an unsupervised machine learning technique. Initialize the PCA class by passing the number of components to the constructor. Call the fit and then transform methods by passing the feature set to these methods. The transform method returns the specified number of principal components. In the code above, we create a PCA object named pca. We did not specify the number of components in the constructor. Hence, all four of the features in the feature set will be returned for both the training and test sets. 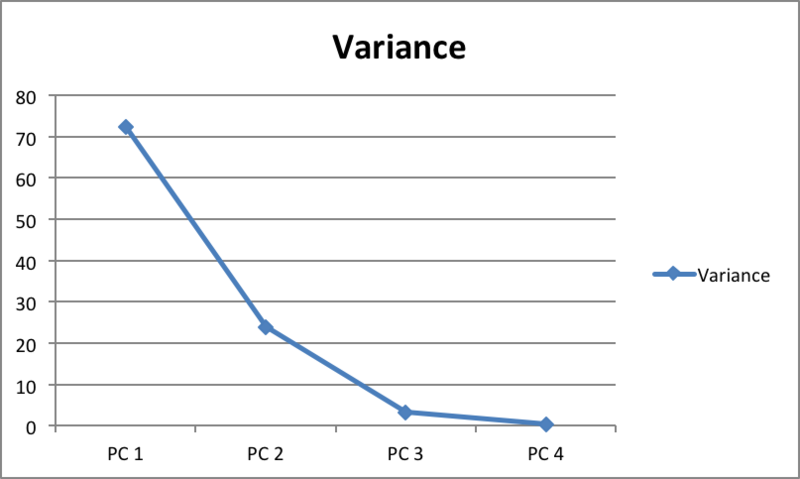 The PCA class contains explained_variance_ratio_ which returns the variance caused by each of the principal components. Execute the following line of code to find the "explained variance ratio". It can be seen that first principal component is responsible for 72.22% variance. Similarly, the second principal component causes 23.9% variance in the dataset. Collectively we can say that (72.22 + 23.9) 96.21% percent of the classification information contained in the feature set is captured by the first two principal components. The rest of the process is straight forward. In this case we'll use random forest classification for making the predictions. It can be seen from the output that with only one feature, the random forest algorithm is able to correctly predict 28 out of 30 instances, resulting in 93.33% accuracy. With two principal components the classification accuracy decreases to 83.33% compared to 93.33% for 1 component. The accuracy received with full feature set is for random forest algorithm is also 93.33%. From the above experimentation we achieved optimal level of accuracy while significantly reducing the number of features in the dataset. We saw that accuracy achieved with only 1 principal component is equal to the accuracy achieved with will feature set i.e. 93.33%. It is also pertinent to mention that the accuracy of a classifier doesn't necessarily improve with increased number of principal components. From the results we can see that the accuracy achieved with one principal component (93.33%) was greater than the one achieved with two principal components (83.33%). For instance, in the chart above, we can see that after the third principal component the change in variance almost diminishes. Therefore, first three components can be selected.